This is almost guaranteed to be the next big geopolitical point of contention. 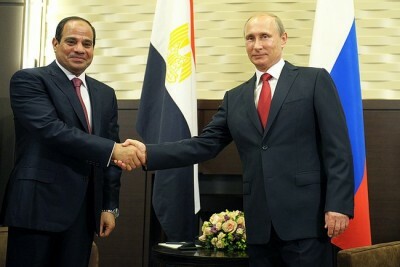 Russia is set to provide Egypt with a $25 billion line of credit to construct the nation’s first nuclear power plant. The plant is set to built in Dabaa and the loan will cover 85% of the costs. It will be repaid over 22 years, with the first repayment scheduled for 2029, at an annual interest rate of three percent. Russia is going to contribute engineers, scientists and general staff to help establish and run the plant. The plant will be ultra-modern and comply with all post-Fukushima safety standards. This deal is sure to prove unsettling to some in the West and perhaps some in Israel; Egypt’s neighbour. Earlier this year, after years of contention over the issue, a world historic deal was reached with Iran that will see the country peacefully developing nuclear power plants. Many Israeli and Western neocons were particularly unhappy with the deal, and Netanyahu even wanted to launch an aggressive attack on Iran at least three times to stop the country from going nuclear. Iran suggested that if Israel wants a nuclear free Middle East that it should turn over its own nuclear weapons first. Nuclear power is a necessity for the development of a modern state and Egypt should be praised for following such a path, moreover Russian support will undoubtedly ensure the project’s success. Yet, with the geopolitical complications that presented themselves in the Iranian case and the volatility of Russian involvement in Syria, it could be possible that we will witness many worrying geopolitical developments in this Egyptian case as we go forward. How do you think the reactionaries in Israel and Washington D.C. will respond to this new, nuclear development in the Middle East?